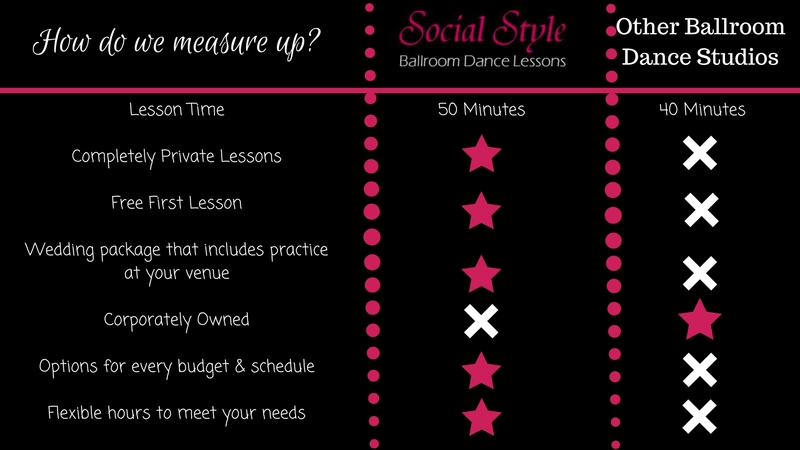 At Social Style, our Dance Lessons will have you feeling confident and comfortable on the dance floor – and we’ll do whatever we can to get you there! We work with you from beginning to end, whether you’re practicing for your wedding, an event, or just an enjoyable date night learning something new! From our completely private dance lessons (no sharing the stereo or floor space!) to our clearly packaged dance lessons, we strive to make coming to your dance lessons something you’ll enjoy, remember, and want to do forever! And you can, with our variety of classes, and even special events – including fundraisers to give back – all of which you can find here. As a small business, owned by one of our amazing instructors, you’ll feel welcome the moment you walk through our door. Our students are our family, and we treat you as such! Each and every private lesson is taught according to what the student wants and needs – we wouldn’t do it any other way. The best part? Your first dance lesson as a new student is free! So, don’t wait! Schedule your free first lesson today by clicking here! We’ll see you soon!